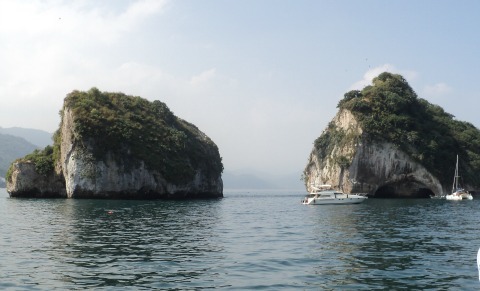 You must visit Los Arcos Puerto Vallarta on your next visit here. These giant rock formations located in Banderas Bay are home to many bird species as well as abundant marine life. Just so you know, los means the and arcos means arches. Thus, Los Arcos, when translated is "The Arches". As a matter of fact, this National Park is the most popular site with tourists in all of Puerto Vallarta. A quick thirty minute boat ride departing from Marina Vallarta is all it takes to get to this popular snorkeling and scuba diving site. This location is home to all kinds of beautiful tropical fish, dolphins and giant manta rays. Humpback whales even frequent The Arches during breeding and birthing season. 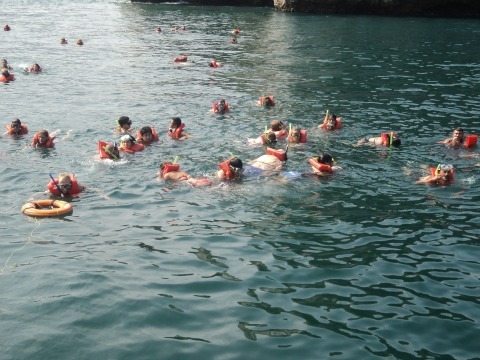 If you are taking one of the larger tour companies, be prepared to only get about 15 minutes of snorkeling time. You will also not be allowed to get very close to the rocks. If at all possible, I would recommend taking a smaller sized or private tour. This will allow more time to see more of the tropical fish, dolphins, turtles and my personal favorite... the seahorses. The best time to have good viewing at this area is between October and December. The water is warmer and clearer. If you go during January through August, your tour guide will entice the fish to come closer with bread or crackers. Now, if you are looking for a cheap way to snorkel for as long as you like or just enjoy Los Archos on your own, then drive over to Boca de Tomatlan. They will rent you a small boat or panga to go snorkeling in for about 800 pesos. That is like $62.00 US for the whole day plus your gear is included in the price. Your best bet is to hire a private boat that can accomodate anywhere from 4 to 150 people for the entire day. The sky's the limit here and they are priced much cheaper than a tour. Contact Chicos Dive Shop for more info and reservations @1-805-617-0121 from Canada and the USA. 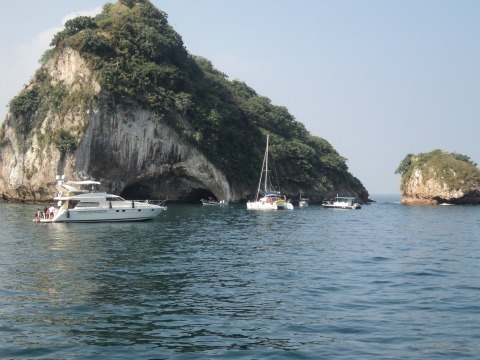 Scuba packages for Los Arcos Puerto Vallarta can also be easily arranged. You do need a current PADI certificate. Easily obtainable at your all inclusive resort or at Chicos Dive Shop. There are many scuba tour companies and a number of tanks to choose from. I again personally recommend Chicos as they are well respected for safety and fun. With English and Spanish speaking staff, they will make sure you get the most out of your dives.